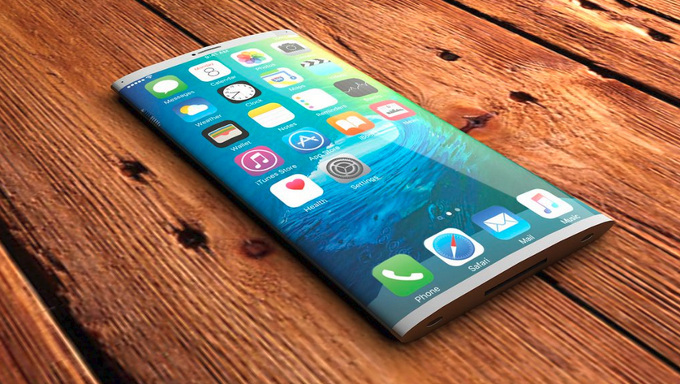 An early concept render of a possible iPhone 8. This is how the iPhone 8 with OLED display may look like next year. A new report from KGI suggests that Apple may add a third iPhone to the lineup in 2017. This third model will be the most interesting one containing an OLED-display that apparently wraps around the edges of the iPhone. KGI Securities released a new research report last week, detailing information about the possible development of iPhones in 2017. While some details contradict earlier reports the report does affirm recent reports stating, that Apple might actually release three iPhone models next year. Apart from the regular 4.7 and 5.5 inch models with LCD screens that will continue to be available and will be slightly updated as well, a possible third iPhone is said to get most of the attention of the Apple team next year. According to KGI, this premium model will have an active display area between 5.1 and 5.2 inches but the OLED panel used will actually be 5.8 inch in size, extending over the edges of the iPhone, making it the first wrap-around screen on any iPhone. KGI further specified, that this OLED display will come from Samsung exclusively. The OLED-model will also have the Home Button integrated beneath the display. There simply won't be enough OLED-panels next year, which seems to be the main reason why Apple apparently decided to continue offering the two regular models as well. Those LCD models will be updated with new glass designs and the Plus model will receive optical image stabilization on both lenses next year. Apple may also consider selling the LCD models for a cheaper price next year, to increase market share. > Notebook / Laptop Reviews and News > News > News Archive > Newsarchive 2016 11 > Apple iPhone 8: Wrap-around OLED display and two regular models?